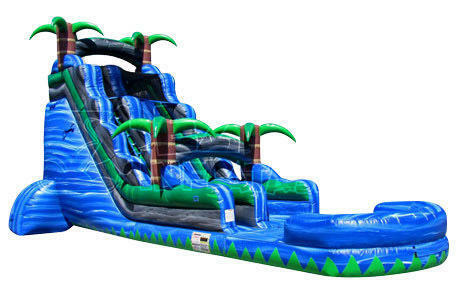 This 22 foot "Blue Crush" water slide is perfect for your backyard birthday party or corporate event! It features a tropical themed 3D environment that your guests will love. Climb the inflatable slide on the left of the unit, and slide down the 22 foot drop into the inflatable pool below. PLEASE NOTE: WATER USE APPROVAL FEE IS INCLUDED IN THE COST OF THE UNIT.